9 Hours flight from civilised Heathrow Terminal 5 you will reach Nassau and from there you will either catch a small local hopper or be whisked 5 mins via taxi to The Executive departures, where you will embark on 25 exhilarating, yet sometimes nail biting minutes, in a plane no bigger than a mini metro and frighteningly, no more high tech. It is not for the faint hearted and perhaps that is one way to keep the island from being overrun. As you are buffeted by the thermals rising from land and sea, you are given your first taster of what will be your own little slice of paradise for the foreseeable week or more and it proves to be a great distraction. Once you land at tiny North Eleuthera Airport, your journey is still not yet over. From there you will be driven 5 mins down the road to the dock by the legendary local by the name of Fine Threads (on account of his Fine Threads) where the local water taxi will run you across the bay between North Eleuthera and your final destination - the somewhat elusive Harbour Island. As you whizz across, you see it is a mere slip of a thing - 3 miles long, by half a mile wide. As you approach the bayside, you are greeted by a rainbow of pretty pastel wooden clapboard cottages dotted about along the water, each with their equally pretty little names..Beside The Point, Point Of View, Doll House, The Whale...From the dock you stack your bags, children and whatever else you thought you couldn't live without, precariously onto your transportation - a golf cart. And if that sea air didn't blow the aeroplane cobwebs away, then your ride to your cottage certainly will. By now, if you have brought children along, they will be flagging, but all will be forgotten after a good nights sleep and your fortuitous early rising the next morning. Fortuitous in the sense your jet lag has afforded you the opportunity to do that one thing we all dream about doing next time we are on vacation but never quite manage - getting up to see the sun rise on the beach in your pyjamas. And that is exactly what we do. It's when you realise all the trains, planes and automobiles and kids whining to get here was worth it! This has to be one of the highlights of every trip here. Another quite peculiar thing about the island is that the people seem genuinely pleased to see you and everyone raises a hand or a smile as you go about your business of not doing business. It is most unnerving for a Brit, but one that leaves you with a warm glow and a spring in your step. The island is long and thin - one side the pretty bay and marinas and the other, the 3 mile, top ten in the world, infamous Pink Sand Beach, along which, a few small boutique hotels, restaurants and beach houses of varying sizes sit up in the dunes. One thing I love about Harbour Island is that the wealth is there, but it is never thrust in your face or obnoxiously displayed. Everything has a (dare I say it) shabby chic to it. The beauty is in the inch thick peeling and flaking paint, the frequent power outages, the food that is delivered by boat once a week, the lack of pretention...there are no hideous fight for reservations, need for high heels or posing. It is just natural, simple, calm, quiet but never, ever boring. That's not to say it is not without it's luxury, but that luxury is never shouted about. It's beauty is astonishing and one can never get used to it. You find yourself settling into a rather lovely routine of getting up fairly early to catch the sun coming up and devouring a fairly American style breakfast. English muffins will become your new best friends and everybody fights for the last one in our house. There are some great places to have breakfast on the island namely the Dunmore Deli and The Landing - both on the bayside. The Landing used to be owned by the incredibly chic and beautiful India Hicks and her equally chic and ruggedly handsome partner David Flint Wood who still live on the island and are very much at the epicentre of island life and the life it draws from outside. India is an extremely successful business woman/TV presenter/boutique owner/designer/ mother to 4/adoptive mother to 1/ model/master of everything and David, her husband, shares his incredible style and taste with his lucky clients near and far. India's jewelbox of a boutique, called The Sugar Mill, houses the most delectable treasures of every ilk, including The Wiggy Kit Collection. Her 's and her partner Linda's incredible eye for finds means you may part with a considerable chunk of change. If you haven't spent enough, you can always pop into the pretty as a picture Blue Rooster and snap up some beautiful woodblock printed kaftans or some coral and turquoise jewels from New Yorker and local home owner Trish Becker, or pop to the luxuriously rustic Dake's Place - home to a beautifully curated collection of niche finds and for the home, or indeed, for you. Miss Mae's should also be on your list if you like clothes with interesting cuts, proportions and fabrics. Unusually, the food on the island is delicious. In my experience food throughout the Caribbean has been rather uninspiring at best and foul at worst. Here you are treated to local lobster, grouper, delicous salads, american beef and Conch cooked, or uncooked in a number of ways. No trip to this island should go without a visit to Queen Conch. It's BYOB, no fuss and casual. You will spot it probably by the line that emerges from it's open air restaurant perched on stilts above the bay. You can order Conch Salad (spicy or fruity), Cracked Conch (my favourite - fried) or Conch Fritters along with some shoe string fries. So moreish and akin to perhaps squid in texture and taste. The preparation of the conch salad is a joy to behold - almost meditative in nature. The Conch Salad is so fresh you can often see it moving in your bowl. The conch is unpaired from it's shell and then expertly sliced a number of ways and further diced with bell peppers, citrus juices, chilli, spices, onions and other delectable ingredients, to produce this most Bahamian of delicacies. A must do! Sip Sip overlooking The Pink Sand Beach is also another must. Open only for lunch - it's name refers to the local slang for 'Gossip'. Reservations cannot be made and so you make your way up from the beach to snag yourself a seat at the bar whilst you wait for a much coveted table. Everything is good here. The pre- lunch cocktails of Goombay Smash, margaritas and passionfruit Sangria's are legendary or you could go simple and just order yourself a local Kallik or Sands Beer. The view is to die for as is the infamous Lobster Quesadillas. Although my last trip had me indulging in the gorgeously garlicky Kale Caesar Salad and the lobster dip on an almost daily basis. Stop in on a Sunday for the surpringly spicy fish soup - a local dish not to be missed. Before you head out pop your head into the little kiosk boutique for a kaftan, a shell necklace or even incongruously a little dress from J Crew (Micky Drexler has a house on the island). If you are not staying in on of the pretty beach houses or cottages that dot the island, then there are a handful of small boutique hotels from The OVC located next to Sip Sip - a stylishly bohemian, no shoes kind of a place that is hip and serves delicious food and often the location for many a celebration on the beach just below. The Dunmore Hotel - almost straight off the pages of a Slim Aarons print, which has a buzzy restaurant that can take you from breakfast to lunch to dinner. The Landing on the harbour side - a bit of an institution - airy and great for breakfast and supper. The Rock House right next door also deserves a mention for supper and it's slightly more exotic vibe. If you want a bigger more americanised hotel, then head to Coral Sands and it's casual beach restaurant. Excitingly, The Pink Sands Hotel is about to undergo a refurb and a new boutique hotel is about to open on the island. A visit to Harbour Island must incorporate at least one picnic on one of the many uninhabited beaches or islands nearby. Pick up some Dunmore Deli sandwiches and a few Kallik's (and plenty of water) and head over via speedboat (you can either hire one for the day or ask a local to chaperone you as the waters are notoriously shallow) and spend an afternoon snorkelling the crystal clear warm waters, sometimes swimming with dolphin, stingrays, turtles and sharks. You can pick up the most glorious sand dollars and sea biscuits for your shell collection, if you can get them home in one piece. This is an experience not to be missed. You will also need access to a boat to whip you across the bay towards Bottom Harbour on North Eleuthera 15 mins from the dock on Harbour Island where you reach a new almost Grecian style lighthouse/restaurant named Ocean Tally. It overlooks the wild, rugged and deserted coastline out to sea and a natural pool carved into the rocks. Too rough in winter but apparently safe enough to bathe in the summer months. Even with a booking, be prepared to wait for one of their tables where you will feast on a myriad of yummy dishes. It's a really special way to while away an afternoon. If you have kids then there is no better way to entertain them, whilst entertaining yourselves with a beach bonfire, complete with copious Whispering Angel, marshmallow toasting and neon glow stick whirling under the light of the moon. Make no mistake - the bonfire construction, gathering of wood and lugging of coolboxes is no mean feat, but so worth it! Totally unforgettable and one of those things you will fondly remember on those rainy days back at home. Just remember to pick your spot wisely, leave nothing behind and always make sure the bonfire is out and smothered! For your groceries, head to Captain Bob's, Pigly Wigly and the Dunmore Deli. For a wide selection of delicious wines and spirits head to Da Vine and The Bristol Cellars. For art local and not so local, gifts and treasures head to The Princess Street Gallery. There is a small convenience store and pharmacy called Tip Top and a hardware store called Chacara Lumber, but otherwise, my advice is - definitely remember to pack your underwear and two pairs of sunglasses...you will have a tough time locating items you forgot to pack. The traditional straw weaving on the island is beautiful and you can bring home something lovely to keep if you head down to the little shacks dotted along the bay area. Head to Daddy D's for a boogie and then I recommend a trip to a local church one Sunday - try The Lighthouse Church of God to hear some beautiful Gospel music and absolve the sins committed the night before. One hour in the air from Gatwick, you arrive in the provincial little airport that is La Rochelle. Even from the air, the sight of the La Rochelle airstrip is rather beautiful set aside from the sparkling waters along the coast and the arching bridge that connects you with that little slice of heaven that is awaiting you. The airport is literally 3 minutes drive from the bridge. 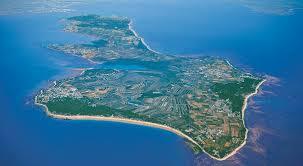 Just across the bridge from the mainland of western France, lies the salty isle of Ile de Re. As you cross the bridge, one is immediately hit with the briny air that is the unmistakeable indication your vacation from reality has begun. Almost as soon as you catch your first whiff of salt air, you are already plotting your resignation from normal life and your subsequent year long sabbatical where you will wear navy and chalky whites exclusively and some form of weather-beaten canvas smock. You catch sight of your reflection in the wing mirror and already you look healthier, more tanned, freckly and are actually convinced you might be getting better with age. It feels as though it is all doing you good. The island of Ile de Re is approximately 22k in length and we are heading to the furthest and chicest village on the island - Les Portes en Re. You can't go too far wrong in staying in most of the other market towns (St Martin - the main town and port, Ars en Re - always provokes much juvenile hilarity and Bois Plage for a more family orientated beach location). Perhaps wise to avoid St Clements de Baliene and Loix as they lack the charm and sophistication that is in abundance elsewhere. The wonderful thing about Ile de Re is its uniformity in architecture - crisp white mainly single storied stuccoed houses adorned with the Ile de Re trademark grey shutters and sunweathered terracotta tile roofs. It is unusual to spot any building that is unsightly, doesn't conform or in need of TLC. I find it tremendously calming to not have to look at anything ugly the whole time you are there. It can get tiresome to have to constantly be at the ready with your camera however. Les Portes offers a wonderful balance of beach, delicious daily food market, a smattering of chic little boutiques and a few picture perfect restaurants and cafes, centred along a pedestrianised and picturesque heart of the village. Everywhere you look there is a lesson to be learnt in how to live life more chicly back home and you swear it there and then you will live life differently on return. The island is as flat as a pancake, and as such - a cyclists dream. Ile de Re positively discriminates in favour of velos and has thoughtfully provided bike routes throughout the island that connect each village with one another. This being said - the second most popular mode of transport - The ubiquitous beaten up, open all sides Mehari might mow you down if you are not paying attention. Again, one wonders how the Mehari might cope with the rain sodden streets of London and you convince yourself, probably brilliantly. There are well maintained bike rentals outfits all over the island that cater for every age and ability. Bike parking is in abundance and so one can pretty much dump the car on arrival and go everywhere on two wheels. ...Like cycling across the salt flats from Les Portes over to Ars en Re. A journey of about 8k across a patchwork of slightly whiffy shallow ponds and marshy grassland, crisscrossed with windy paths that snake you past the occasional vineyard, marshland small holding and stables. It's the perfect distance to make one feel as though you have achieved something without losing the will to live. If you are an ornithologist, I bet there is a lot that might catch your eye along the way too. Ars en Re is home to a beautiful church spire that changes position wildly the entire cycle ride there. But once there, you are greeted by the market, which, although not the prettiest, one can certainly find the occasional stall that sells you delicious soaps, rumpled linen beach shirts or block printed tablecloths or quilts. If you investigate further you discover the indoor/outdoor food market where our chef had been sourcing all the ingredients for our nightly feasts. Ile de Re is renowned for their spectacular oysters and seafood. I came across the most pristine, fresh and inviting fishmongers I had ever seen, where the fish glistened with sparkly, clear eyes and firm flesh atop mounds of crushed ice. Ile de Re salt of every variety and hybrid was in evidence as were the infamous sea salt caramels which must come home with you. Why is it that fruit and vegetables from a french market miraculously make you want to start cooking and eating more healthily? Travelling provides so much inspiration when it comes to designing a collection and I am always thinking how my pieces can work in a multitude of destinations and climates, whether they can multi-task and indeed whether they answer the hi/lo dressing question. Always easy to throw over, never trying too hard and looking equally at home on the beach, in a city, during the day with sandals, in the evening with heels. My collection had already taken me seamlessly through 7 weeks spent at my Pop Up on Kings Road in London from May till July and then on for 3 weeks in 90% humidity in Harbour Island in the Bahamas late July and now on to blustery, windswept Ile de Re in August. I was excited to see I had found a brilliant formula that worked no matter where I was and what I was doing.